OUR PRICE STRUCTURE REFLECTS A LEVEL SYSTEM. ALL OF THE AMOUNTS LISTED BELOW ARE STARTING AT PRICES FOR EACH OF OUR CURRENT LEVELS. STYLIST LEVELS ARE BASED ON DEMAND FOR THEIR TIME AND NOT BASED ON YEARS OF EXPERIENCE. 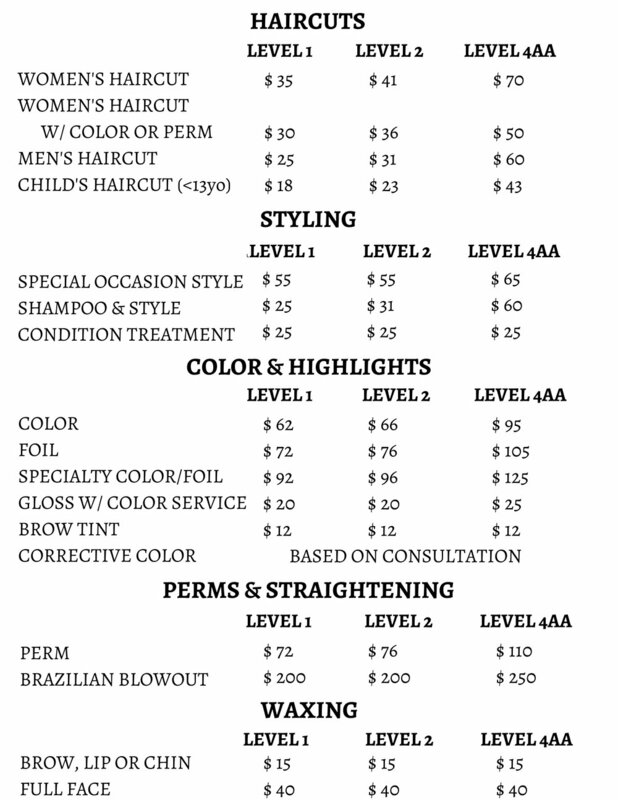 PRICING MAY VARY DEPENDING ON THE SPECIFICS OF EACH SERVICE (i.e. TECHNIQUE, AMOUNT OF PRODUCT USED). TO CUSTOMIZE A PERFECT SERVICE FOR YOU, ALL OF OUR SERVICES ARE A LA CARTE. WE WELCOME ALL GUESTS TO COME IN FOR A COMPLIMENTARY CONSULTATION WITH ANY OF OUR STYLISTS TO RECEIVE AN ACCURATE QUOTE FOR YOUR DESIRED SERVICE(S).